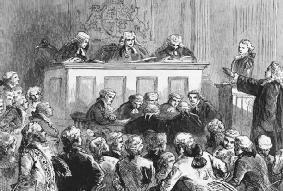 Andrew Hamilton (standing, arm extended) defends New York printer and journalist John Peter Zenger in his 1735 political trial on charges of seditious libel. A trial that addresses political questions, involves political officials, or serves political agendas. In certain circumstances the term is used in a pejorative sense to criticize a particular trial or proceeding as unfair or unjust. Although it is sometimes difficult to distinguish political trials from ordinary legal proceedings, political trials generally fall into one of four categories. The most familiar type of political trial is a partisan trial, which consists of criminal legal proceedings instituted by the government to solidify its power, extinguish its opposition, or flex its muscle. Such political trials, while taking place in a courtroom, have little to do with justice. Instead, partisan trials serve to promote the ideology of those holding the reins of power. In many countries partisan trials are easy to identify because the prosecutors, judges, and defense attorneys are chosen by the government based on their allegiance to the regime's political philosophy. In other countries the government may exert subtle pressure upon judges and attorneys to influence the outcome of a case. In either situation such proceedings rarely produce a result that is fair or impartial. Some of the most notorious partisan trials took place in Adolf Hitler's Germany and Joseph Stalin's Soviet Union where many of the judges, prosecutors, and defense attorneys served as instruments of terror and propaganda for their totalitarian leaders. A second familiar type of political trial involves the prosecution of religious and political dissenters. Since time immemorial, governments have been confronted by persons who disobey the law for reasons of conscience. Such disobedience, which can take the form of active or passive resistance, presents a dilemma for most governments. On the one hand, governments must prosecute persons who disobey the law to maintain the integrity of the legal system. Yet if the prosecution takes place in a public forum, a political or religious dissenter is likely to question the propriety of a particular law or policy and challenge the legitimacy or competency of the existing government. On the other hand, if the government covertly silences a dissenter in private, the legal system exposes itself to charges of persecution, which compromises the public's respect for the law. By prosecuting dissenters in open court before an impartial judge and an unbiased jury, the U.S. legal system attempts to strike a balance between the competing interests of the government and dissenters. Historically, many regimes have been unable to achieve this delicate balance. In ancient Greece 500 Athenian jurors made a martyr out of Socrates when they sentenced him to death for corrupting the youth and criticizing government officials. The Roman governor Pontius Pilate sparked concerted religious opposition to his government by condemning Jesus of Nazareth for blasphemously claiming to be the Son of God and King of the Jews. In 1735 British authorities planted the seeds of rebellion in the American colonies when they unsuccessfully prosecuted journalist John Peter Zenger for seditious libel. A third common type of political trial involves nationalists who challenge a government's authority to represent them. Nationalists speak for an identifiable group of people who share a common characteristic, such as race, religion, or ethnicity. Trials of nationalists call into question both the unity of society and the capacity of a regime to speak for the people. Governments prosecute nationalists in part to publicly affirm their ability and resolve to govern the populace. Faced with certain defeat in the short run, many nationalists still present a vigorous defense to raise political awareness and record their battle for posterity. The 1922 trial of mohandas k. gandhi, for example, served as a lightning rod of nationalism in India by uniting opposition against the oppressive imperial government of Great Britain. The Treason trials of Nelson Mandela in Pretoria, which took place in the late 1950s and early 1960s, similarly raised the consciousness of blacks in South Africa and focused the world's attention on the apartheid system of government. In both cases, though the nationalists were temporarily silenced by the regimes they opposed, their causes ultimately prevailed as their people were given an equal voice in the affairs of government. The fourth type of political trial involves the trial of entire regimes, or the leading members of a particular government. When governments are overthrown by a coup or revolution, the new regime must decide how to treat members of the old regime. In some instances members of the old regime are granted clemency, and efforts are made to assimilate them into society. In other instances members of the old regime are expelled from office and banished from the country and deprived of their citizenship. However, in a great number of cases the old regime is put on trial by the new regime and prosecuted for every transgression, great and small. These trials can serve at least two purposes. First, they can highlight the malignant qualities of the demised regime. Second, they can underscore the virtue of the new regime by tempering the vengeful calls for summary executions that regularly follow the cessation of hostilities in a revolution, civil war, or other type of military conflict. The Nuremberg War Crimes trials, in which twenty-four of the top Nazis were tried by the Allied powers following World War II, provides a modern example in which members of a vilified regime were afforded a full assortment of legal protections despite demands for summary execution. In a limited sense all trials have a political element. As one of the three branches of government, the judiciary is an inherent part of the political system. Additionally, all trials carry with them tangible political ramifications by delineating the rights and responsibilities of civil and criminal litigants. Because many judicial decisions are considered precedent, the legal principles established in one case may be applied to other members of society in a subsequent analogous case. However, in the United States the term political trial has acquired a broader meaning. A trial is generally characterized as political when it presents a question that transcends the narrow issue of guilt or innocence by implicating larger societal, cultural, or international considerations. The Watergate trials of the mid-1970s, for example, focused on the legal issues of breaking and entering, conspiracy, and Obstruction of Justice. However, these trials also dramatized the fall of a president and the consequences of abusing power. Political trials often present basic dilemmas that engage the public in a common dialogue. These trials may prompt society to examine and even reconsider its fundamental values. Certain political trials, such as the Nuremberg and Watergate trials, have helped define an era or a nation. Carville, James. 1998. And the Horse He Rode in On: The People vs. Kenneth Starr. New York: Simon & Schuster. Christenson, Ron. 1999. Political Trials: Gordian Knots in the Law. 2d ed. New Brunswick, N.J.: Transaction Press. Hiss, Anthony. 1999. The View from Alger's Window: A Son's Memoir. New York: Knopf. Jackson, Robert H. 1946. The Case Against the Nazi War Criminals. New York: Knopf. Lahav, Pnina. 2000. "The Chicago Conspiracy Trial: Character and Judicial Discretion." University of Colorado Law Review 71 (mid-winter). Levine, Mark, George C. McNamee, and Daniel Greenberg. 1970. Tales of Hoffman (From the Trial of the Chicago 7). New York: Bantam. Black Panther Party; Chicago Eight; Civil Rights Movement; Communism; Davis, Angela Yvonne; King, Martin Luther, Jr.; Nuremberg Trials; Pacifism; Thoreau, Henry David. Member of the Fatah Revolutionary Council, Hassan Faraj, said that Amira's trial is a political trial, which has become clear after a series of hearings of the Israeli courts, where the defense proved that there is no conviction of Amira and that the court sessions are sham, since they have not been able to prove evidence him. And for more than two years, (until November 89), the Damocles' sword of political trial against us, for the "counter-state activities" and other "capital crimes" was hanging over us. While Catalonia's former leader says he was forced into exile to avoid an unfair political trial in Spain, his opponents say Puigdemont is a fugitive who is flouting Spain's judiciary while pursuing an independence drive that violates the Constitution. Also, they condemned the political trial of Asim Omer, a university student accused of killing a police officer during a student demonstration in April 2016. It is simply a political trial where even proofs against the former Prime Minister are not sufficient. Or how the breakdown of Comelec Chair Bautista's marriage could lead to his impeachment-a purely political trial, by the way. 8, 2016)--had completed a tumultuous session during which lawmakers threatened to subject Maduro to a political trial. This trial is a political trial, in which I refuse to cooperate. The pro-European oriented proposals sound convincing, regarding the political, moral and legal responsibility which can be reached with a political trial and free fair elections. The Tlatlaya case is another reason why we are asking for a political trial for Plascencia," said Edgar Cortez, who said the ombud was keeping silent to protect the administration. When former prime minister Adrian Nastase was convicted to four years in prison for taking bribes and a[logical not]400,000 of his and his wife's illicit wealth was seized, his party colleagues said it was a political trial ordered by the President, Traian Basescu. The match-fixing case was a political trial with a political verdict," Yyldyrym said.